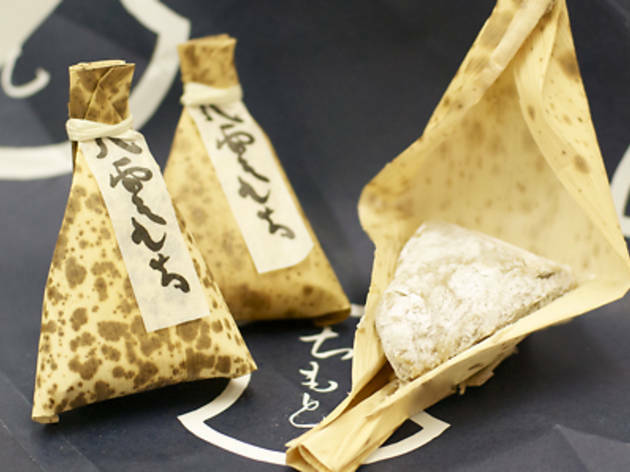 Located a short walk along Meguro-dori from Toritsu-Daigaku Station, this traditional sweet shop is a sanctuary away from its busy surroundings. The sound of a decorative water well inside creates an atmosphere that'll help you forget the bustle outside. You’ll find various sweets neatly displayed in a showcase, including seasonal favourites such as sakuramochi (a popular springtime sweet made of chewy rice cake, sweet bean paste and pickled cherry leaves) and kuri mushi-yokan (steamed chestnut bean jelly), but our favourite is the shop's very own Yakumo Mochi. This soft confection, made from gyuhi (a soft, delicate variety of rice cake similar to Turkish Delight), has the mellow sweetness of brown sugar, set off by the taste of cashews to create a flavour that can’t be found elsewhere. There's a small eat-in area that gets extremely crowded in summer, when locals queue up to get a taste of Chimoto's famed kakigori.